Starting in January 2019, the Federal State Board of Physical Therapy (FSBPT) implemented changes to the National Physical Therapy Exam (NPTE). In September 2017, there was a deferment on increasing the cost of the NPTE fee; however, this new fee increase of $485 (from $400) is now active as of January 2019. There are no changes to the Prometric Center fees. Currently, the fee increase only affects physical therapy candidates taking the NPTE. According to the FSBPT January’s new brief, starting on February 1, 2019, there will be an increase of $10 for a service charge fee. This new fee affects candidates who want a score transfer (increased to $90) or who are requesting individual score reports (increased to $90). The performance feedback report will increase to $100. The latest NPTE change to the exam format (introduced in January 2019) focused on the Integumentary, specifically pressure Injury terminology and classification. In 2018, a new NPTE blueprint format was introduced and later in the year there were new blood pressure guidelines. 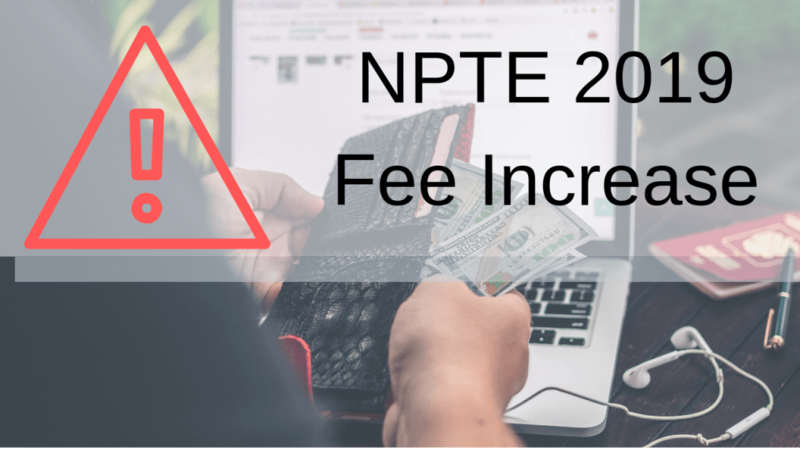 While the new service fee charge is a minor increase, the fee for sitting for the NPTE has increased by 17.5% this year. Please keep in mind that there is a maximum of six attempts where a limit of three attempts is allowed in a given 12-month period. When studying for the NPTE, it’s best to be proactive and aim to be solid on the scores to have the best success on passing.